The US Navy's FLTSATCOM (Fleet Satellite Communications System) is a constellation of five operational satellites used by both the Navy and Air Force as well as the presidential command network. The system, with a design life of five years, serves as a secure communications link between the three users. Each FLTSATCOM spacecraft has 23 communications channels in the ultra-high and super-high frequency bands. Ten of the channels are used by the Navy for worldwide communications among its land, sea and air forces. Twelve of the channels are used by the Air Force as part of the Air Force Satellite Communications System for command and control nuclear capable forces. A 500 kilohertz channel on the satellite is allotted to National Command Authority. The development of FLTSATCOM began in 1972 with the awarding of a development contract to TRW. The Block 2 satellites were launched on Atlas-G Centaur-D1AR boosters between 1986 and 1989. The ground segment of the fleet satellite system consists of links among designated and mobile users, including most U.S. Navy ships and selected Air Force and Navy aircraft, submarines, global ground stations and presidential command networks. These terminals are being managed and acquired by the individual services. FLTSATCOM systems feature a main transmitting antenna that's 11 feet in diameter and surrounded by a 16-foot diameter wire mesh screen. Once in orbit, the folded screen is deployed by ground command. A 13.5 foot helical receive antenna, 13-inches in diameter at the base, is mounted outside the edge of the transmit antenna dish. The receive antenna also is folded within the Atlas Centaur fairing during launch and deployed by separate ground commands. The body itself is hexagonal and is 8 inches wide and 4 feet tail. 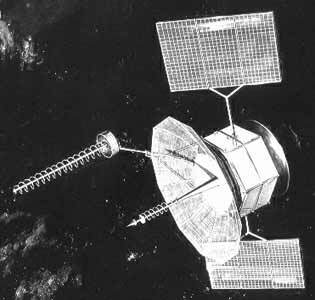 Three improved Block 2 satellites extended the operation of the system well into the 1990s. The new systems carry an experimental extra-high-frequency (EHF) package as a testbed for terminals being developed for the Milstar communications system. Primary electrical power for the spacecraft is provided by two deployable solar array paddles which supply approximately 1,200 Watts of power. In addition, three nickel-cadmium batteries, each having 24-sealed, 34-amp-hour cells, provide power during eclipse operations. With a design life of 5 years, the satellites are three-axis stabilized in geosynchronous orbit. The FLTSATCOM program was managed by the Space and Naval Warfare Systems Command. The Air Force Space Systems Division, Los Angeles, was responsible for production, launch vehicle/spacecraft integration and tracking and data acquisition. FLTSATCOM spacecraft were built in Redondo Beach, CA, by the Defense and Space Systems Group of TRW, Inc.
Two satellites in the planned eight-satellite series were lost - the Flight 4 spacecraft was damaged during launch in 1981 and did not operate and the Flight 6 spacecraft and launch vehicle were destroyed by an apparent lightning strike during launch in 1987.